You may be familiar with the Dr. Seuss book Wacky Wednesday (actually published under another of Theodor Seuss Geisel's pen names, Theo. LeSieg). Anemo and I read it yesterday morning. Here's why. Anemo has been attending two "camps" per day, a reading camp and a basketball camp. His basketball coaches told him Wednesday would be Wacky Wednesday, the day of the week when everyone dresses in some unorthodox way. For instance, some kids like to wear their shirt inside-out, or backwards, or both; some color their hair or wear a funny hat. Anemo chose to wear his long-sleeved French mime shirt along with two different socks. I thought it would be clever to connect the two camps by reading Wacky Wednesday. My intent was to help transfer some of Anemo's enthusiasm for basketball to the much-needed practice of decoding language. I admit it was 100% my idea, but Anemo played along. I had to do all of the reading though. Anemo thrives on the basketball court. It's where he feels most comfortable, and his coaches tell us he shows advanced skills for his age. Shawn, one of Anemo's coaches who is taking time off from Howard University, expressed a real interest in seeing Anemo progress in the sport. This is all amusing to me, because the only sport Anemo would know had he grown up in Ethiopia is soccer. So, as I tried to do for reading yesterday, I've also been attempting to generate some excitement around soccer. Anemo and I have even watched a few World Cup matches together. Taped to Anemo's bedroom door. The only two players pictured still in the tournament are Messi and Neymar. When I scheduled my Amharic lesson this week, I was sensitive to the World Cup schedule, knowing how much Lulit loves the sport. "BeTam, BeTam, BeTam!" she said the first time እግር ኳስ (igger kwas), "football," came up, meaning "a lot, a lot, a lot!" We agreed to meet between the two games on Tuesday (Argentina vs. Switzerland, and Belgium vs. USA), not knowing, of course, that the first and only goal from Argentina wouldn't come until the 118th minute, well after the start of the lesson. Since Lulit had the game playing on the big screen TV during our time together, it made sense to learn the vocabulary of football in Amharic and even try to have a simple conversation. As for the vocabulary, the first thing I noticed was that the word for goal is ግብ (gib), which contains the shortest possible vowel sound and therefore must be a bummer for Ethiopian sports broadcasters. Learning that the word for kick is ምት (mit), I noticed that the word for header is ራስ ምት(ras mit), literally head kick. (Incidentally, ራስ (ras) is the same word and meaning as in Ras Täfäri, which will undoubtedly be the subject of a future blog post.) I also learned that a lot of football vocabulary is taken directly from Italian, since Italians had a large influence on the sport in Ethiopia in the 30s and 40s (mostly bad, according to this history of Ethiopian football, which asserts that the Ethiopian St. George Club beat the Italian Fortitito 4 to 1 in 1942 in an athletic echo of the Battle of Adwa). Thus, the word for penalty kick doesn't contain ምት at all; instead, it's a transliteration of the Italian word, rigore. Likewise, the English word "card" has entered the Amharic vocabulary, and so yellow card is ቢጫ ካርድ (BeeCHa card) while red card is ቀይ ካርድ (Qey card). "It's like [expecting] the British to root for France or Argentinians to root for Brazil. They've always (hulu gizay) not liked each other." In Nigerian behal (culture), bezu gizay (often) ...[long pause]... aThalyne...but it could be a stereotype. They like to cheat at things. There's always that impression of, oh, you don't want to be like a Nigerian. I don't know why. Nigeria Tirusim yellom...they don't have a good reputation or they don't have a good name. Ethiopians, for better or worse, are known to be arrogant and feel they are far superior from Nigerians somehow. I don't know why. ... Some of it is for the cheating, some of it it is for, like, not being on the up and up all the time, so Ethiopia always looks down. But that's just the stereotype. I'm not saying everybody. ... I think sometimes African Americans also say that. Ethiopians are just kind of too arrogant. They don't think they're black enough. ... We always have had that reputation...we always feel we have a big culture, we have a proud culture, we beat the colonizers. ... Every country feels that 'our country is the greatest,' but then we always do rub that into the rest of Africa. ... But it's just a stereotype. Lulit was looking forward to being with a lot of Ethiopians on Ethiopia Gan (Day) in San Jose on July 4. It will take place at the conclusion of the 31st Annual Soccer Tournament put on by the Ethiopian Sports Federation in North America (ESFNA). I learned that every year Ethiopian diaspora soccer teams all over North America get together to compete. This year 35 teams are competing in San Jose. Last year it was in Maryland. Now this is the way to confuse football and football. It is with great pleasure and enthusiasm that ESFNA announces its participation and partnership with the Ethiopian-American Council in the 10th Annual Ethiopian Heritage Flag Raising Ceremony over the City Hall of San Jose, California. ... Every year, the City of San Jose holds the Ethiopian Heritage Flag Raising Day in appreciation and celebration of Ethiopia’s and Ethiopians’ contribution to its city and across the world. Since 2005, with the exception of 2010, the flag raising event took place around the Ethiopian New Year in September. This year, EAC along with residents of San Jose has lobbied the City to move the event to July 3, 2014 in order to coincide this important event with ESFNA’s 31st Cultural and Soccer Tournament. 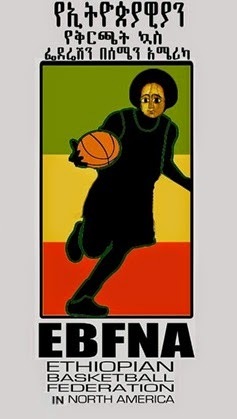 Much to my surprise, I learned that there is even an Ethiopian Basketball Federation in North America (EBFNA) that is holding its 14th annual tournament during this week. Maybe Anemo will play in this league someday, if the NBA thing doesn't work out. I would definitely be taking Anemo to both basketball and soccer matches today if we weren't leaving for Curaçao tomorrow morning at 4:00 AM. This could be the closest the "Ethiopian extravaganza" gets to our home for a long time. Which reminds me that I'll also be missing the Germany vs. France quarterfinal match tomorrow morning while we're on the flight to Miami. At least Anemo and I will be reading Dr. Seuss's Wacky Wednesday on the plane, and I can wonder whether Geisel or LeSieg will win.